I'm sorry I haven't posted in a while but, being a stand in for three people on their summer holidays, I have been so stressed since July 1st that the last thing I wanted to do when I got home was sitting in front of a computer, even though it meant doing something I like. I hope things will get better from next week on, because those 3 people are gonna gradually come back and that means I'm gonna gradually go back to my usual workload. Anyways, here's a post I've been meaning to write for about a month, and it's my first empties post. I have decided to jump in the wagon of these posts since I find them to be quite informative. Now, I have to say that even if I don't like a product, I hate wasting money so, I try to use products up to their last drop. 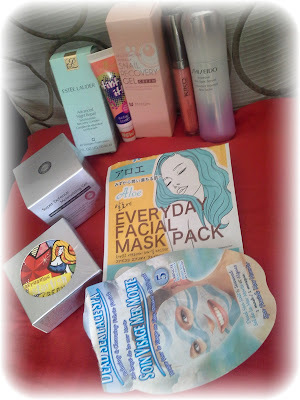 Which means I will include products I liked and products I didn't like much in my empties posts. Lets see... I think I will start with the serums, which are also the most expensive items in the lot. I bought this for Christmas, on a crazy shopping spree at Sephora. Even with a 20% discount, this thing was insanely expensive. I applied it day and night only on the areas where I suffer from hyperpigmentation an the 30ml in this bottle lasted me for a good three months. The texture of this serum is quite runny and I didn't find it to be sticky at all. 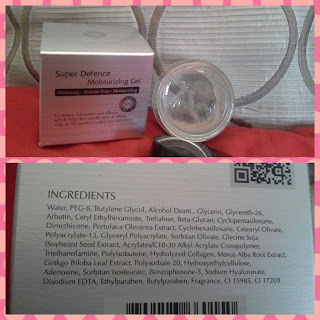 Unfortunately, I don't have the box with me anymore so, I cannot tell you the ingredients on the serum. This product worked well on the new spots, caused by the occasional pimples I get at that time of the month (touch them or not, they tend to leave a pigmentation mark after them) and it made some old pigmentation spots fade away but it didn't get rid of all them. Conclusion: I've tried other products in the market that are less expensive and work just as well for me so, I will not be repurchasing this serum. Same shopping spree at Sephora and also on the pricey side. Also 30ml that lasted me for a couple of months, applying 2 to 3 drops every night in the palm of my hand, rubbing my hands together and patting the product on my face. This serum is orangey (though it is difficult to appreciate it in the picture because of the flash), the texture is not as runny as the Shisheido's Intensive Anti-Spot Serum, and it is sticky so you need to pat and hold your hands on your face for better absortion. 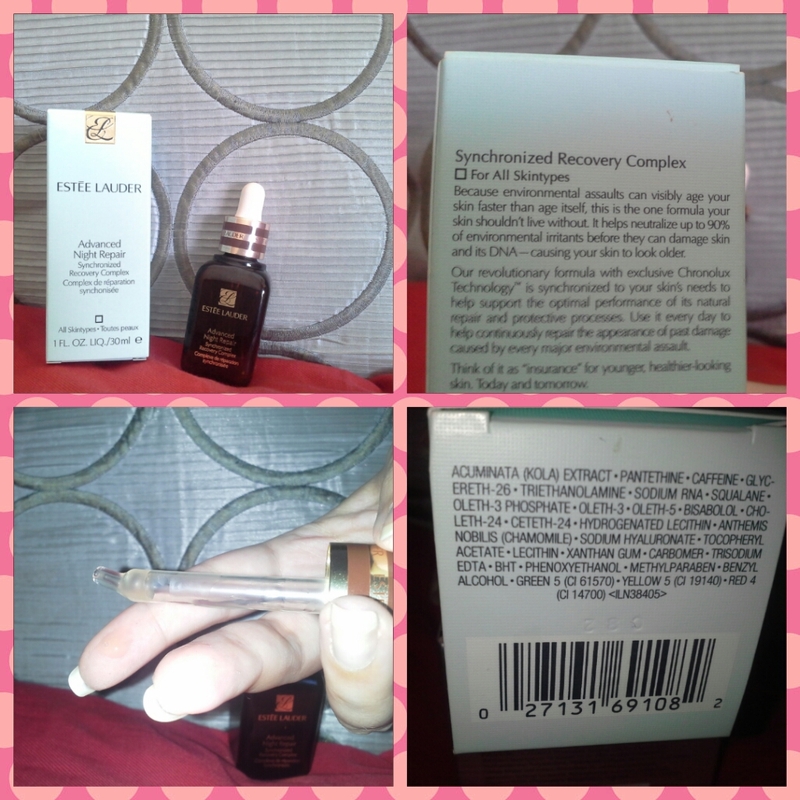 I did not notice any change in my skin while using this serum. Maybe it takes more than two months to see how it protects your skin from harmful environments and helps your skin renew itself. 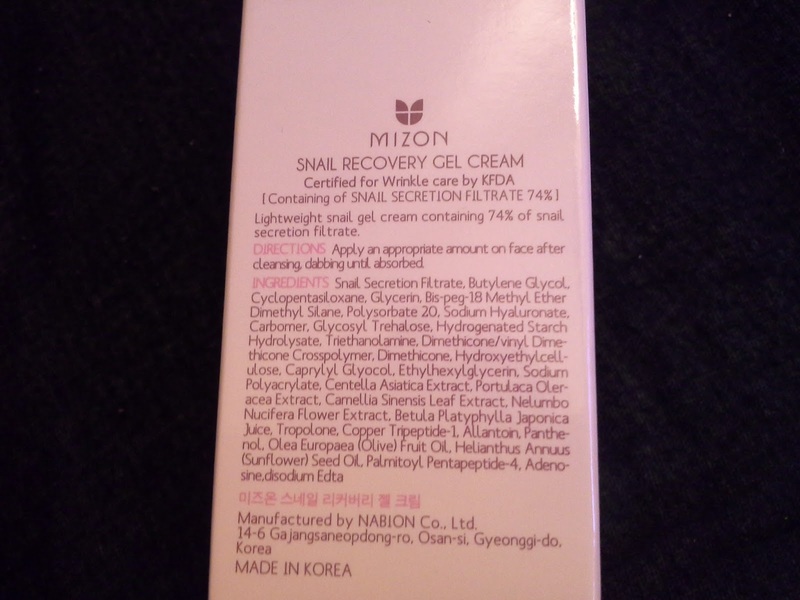 Conclusion: I might by this serum again, but I will first try its copycats from Missha or the one Mizon came up with, which also has whitening effects. Of course, the Korean copycats are a fraction of Estee Lauder's price. This little guy did what it promissed: it made my lips plumper and soft from the first use, but what's interesting about its formula is that the more you use it, the more moisturized and plumper your lips become. There's still a bit left (and whatever product that got stuck to the walls of the tube) but I can't use it anymore because now I can feel the shimmers on my lips like they were white thin sand: not pleasant. The other downside of the formula was that it was really sticky. By the way, this was color 18 Pearly Pastel Pink and it costed 6,90€. Conclusion: I liked the effect this product had on my lips, but I did not like how it felt on my lips. If you wanna try this, I would go for a color without shimmers in it. I bought colour 02 Turn to Lucky. It stayed mostly orange on my lips, though a couple of times it got a dark pinkish hue, and the glossiness disapeared after a cup of tea, but the colour stayed for hours. 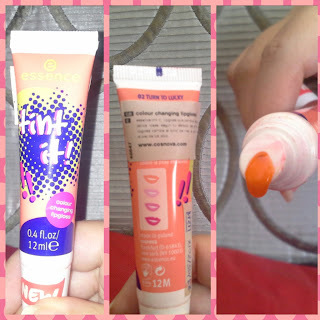 As you can see in the picture (the last squeeze) it came out orange, but when you applied it to the lips, the color became much clear, almost see through on the edges until the color developed so, if you were not careful, you ended up staining were you didn't want to and you found that out a couple of minutes later, when you were out the door and checked your reflection on the mirror of the elevator. As I mention, the color stays for hours and it's hard to rubb it away. Conclusion: for less than 3€ it is a very decent product. There are other lip tints that I want to try but I wouldn't mind buying this one again. 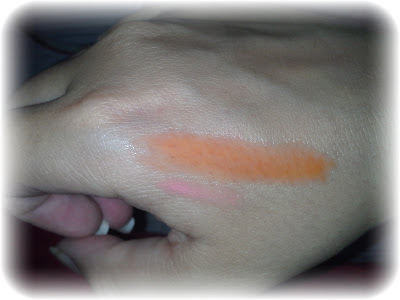 Here's the swatch of both lip products mentioned in this post. Let's talk about paper masks now. I bought this at Claire's for about 2€. I put it on my clean face, left in on for 15 minutes (though the package says to leave it on for 5 to 10 minutes), took the paper mask off and patted the remaining essence on my face. 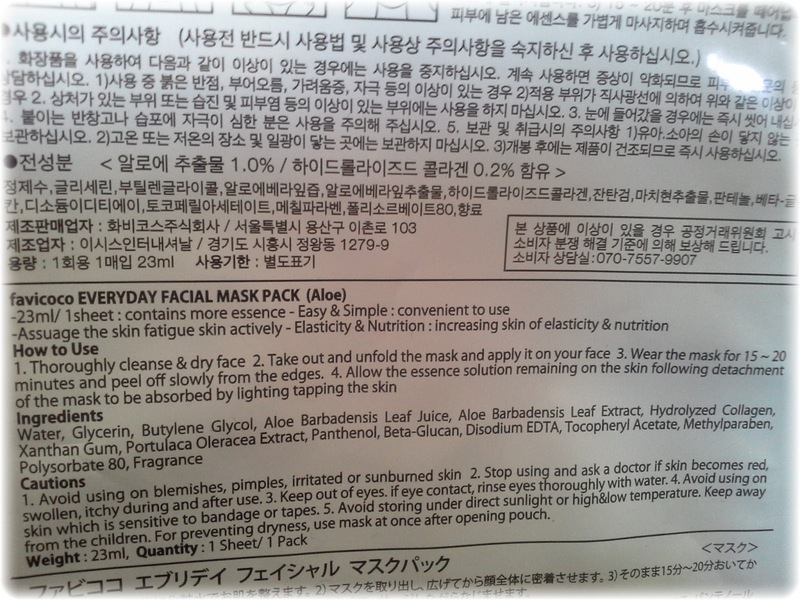 Here, the package also says you have to rinse your face ? 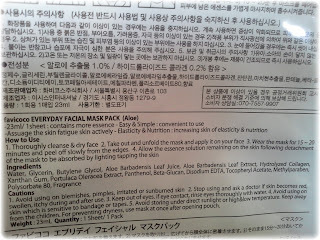 I think they copy-pasted the instructions from a face mask in a cream/paste form. Anyways, I did not rinse my face, because there was nothing to be rinsed off. My oh my! 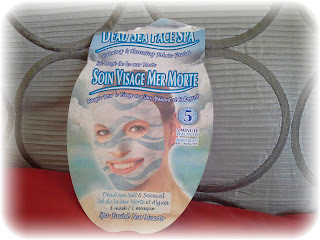 My skin felt so clean and smooth after using this mask! And more, it left a cool feeling on my skin that lasted for hours, even in the hot humid summer weather in Barcelona. I couldn't take a reasonably clear picture of the packaging showing the ingredients so, I'm listing them here: Aqua (water), Glycerin, Hydrolyzed Oats, PPG-1- PEG-9- Lauryl Glycol Ether, Glucose Sodium Citrate, Parfum (Fragrance), Ascophyllum Nodosum Extract, Maris Salt (Sea Salt), Menthyl PCA, Chondrus Crispus (Carrageenan), Citric Acid, Sorbitol, Menthol, Glucose Oxidase, Lactoperoxidase, Propylene Glycol, Chondrus Crispus (Carrageenan) Extract, Fucus Vesiculosus Extract, Laminaria Digilata Extract, Phenoxyethanol, Potassium Sorbate, Sodium Benzoate, Sorbic Acid. 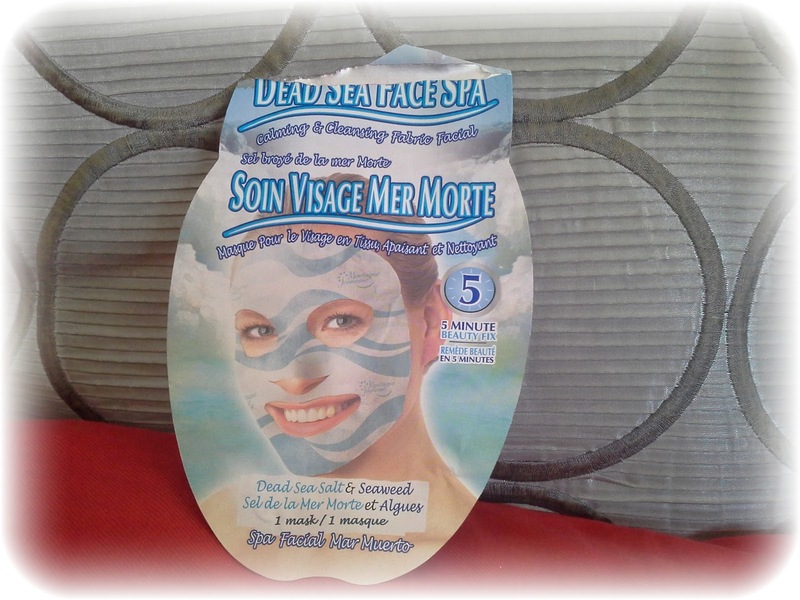 Conclusion: I loved this mask and there's no doubt I will buy it again. This Korean paper mask left my skin feeling soft and moisturized. I like that it has cuts to better fit the shappe of your face and I love that the eye wholes are not totally wasted because they double up under the eyes. There's a caution sentence, as you'll see in the picture below, telling you to avoid using this mask on blemishes, pimples and irritated or sunburned skin. Isn't aloe vera supposed to be good for all those things? Must be some other ingredient that might irritate the skin. There's essence enough for a couple of masks so, what I do after using the mask is that I keep the package (trying to close it as well as possible)and, two days after, I peel a cotton pad into three or four layers, dip the the pieces in the remaining essence and voilà: I have another mask ready to be applied to my face! Conclusion: These masks are sold in packs of 10 so I still have 9 to go. I like them but there are a lot of other paper masks out there I want to try out. 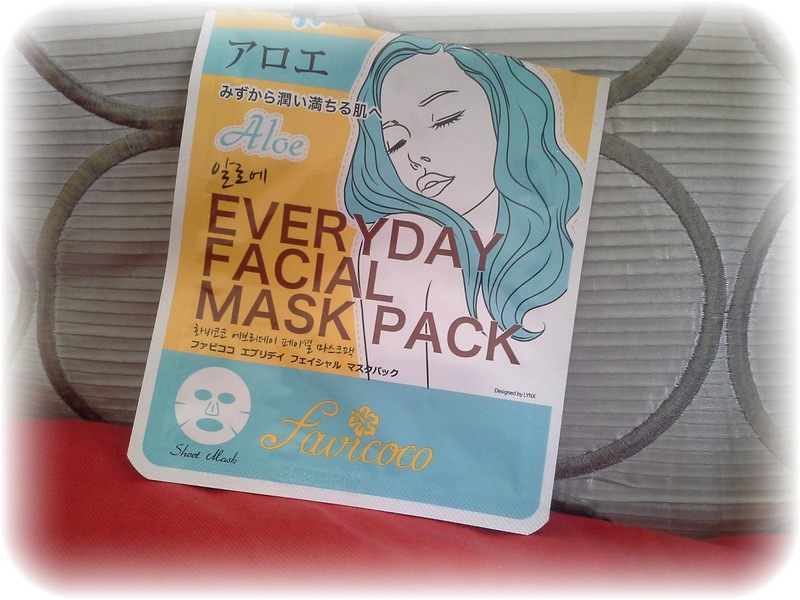 I might buy other Favicoco masks again, but I'd rather try a different ingredient, like collagen or pearl. 50ml that costed me about 10€ on eBay and lasted for a good two months, using it morning and night. Being it a gel-cream consistency, it was not moisturizing enough for my dry skin, even though I used it in winter/spring time. It could also double up as a night pack just by applying a bit more of the product on the face and leaving it overnight, and I used it as such twice a week so, that's why I run out of it so quickly. If you look at the list of ingredients, you'll see that alcohol denat is in the fourth place so, don't be surprised if you smell of alcohol when you're applying the cream. The smell fades away after a few seconds. In the mornings, I used to mix this cream with my BB cream. It blended nicely with both of the BB creams I used at that time (Holika Holika's Aqua Petit Jelly BB Cream and Peripera's I Love BB Cream). 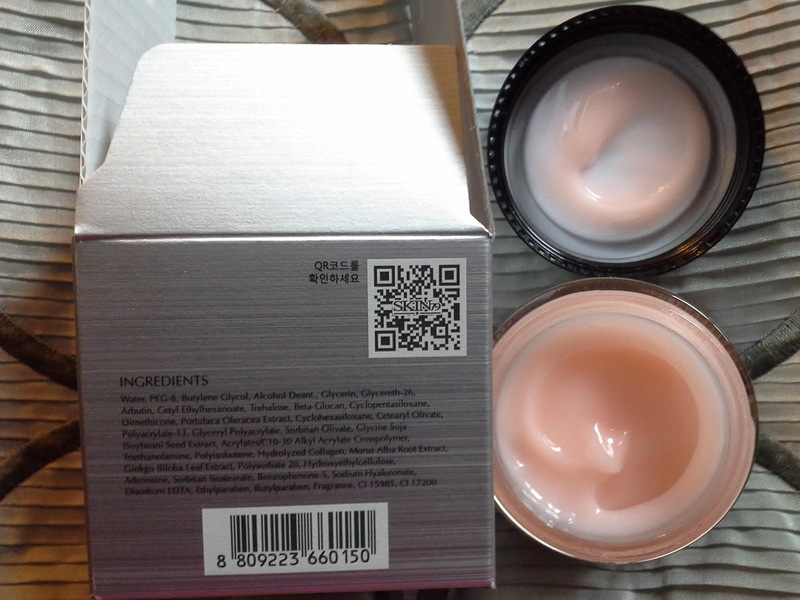 Both have really good coverage and I mixed the moisturizer to achieve that no makeup makeup look. 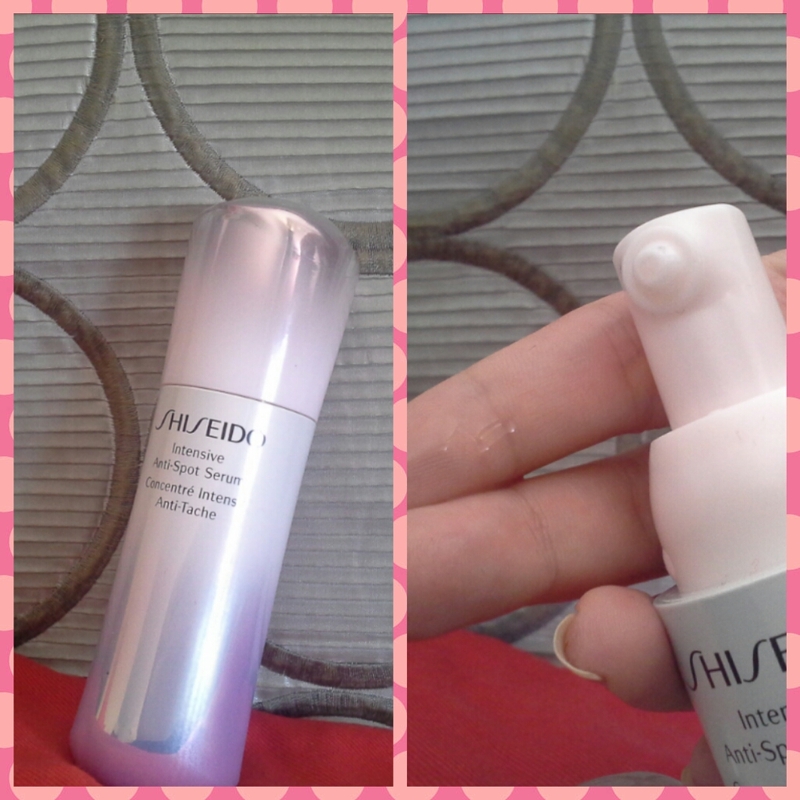 Conclusion: This moisturizer might work on combination to oily skin, but it was not moisturizing enough for my dry skin. I bought it on eBay for about 5€. Being a gel cream, I knew it would not be moisturizng enough for my skin (and it wasn't) so, I used it mainly as a night pack. 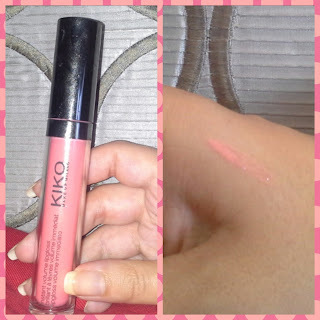 The texture is a bit runnier than that of a gel so, it glides beautifully on the skin. It takes a while and a lot of patting for this product to be absorbed. I also applied it on a wound I got from some ill-fitting shoes and the wound healed nicely and fast without leaving a scar. 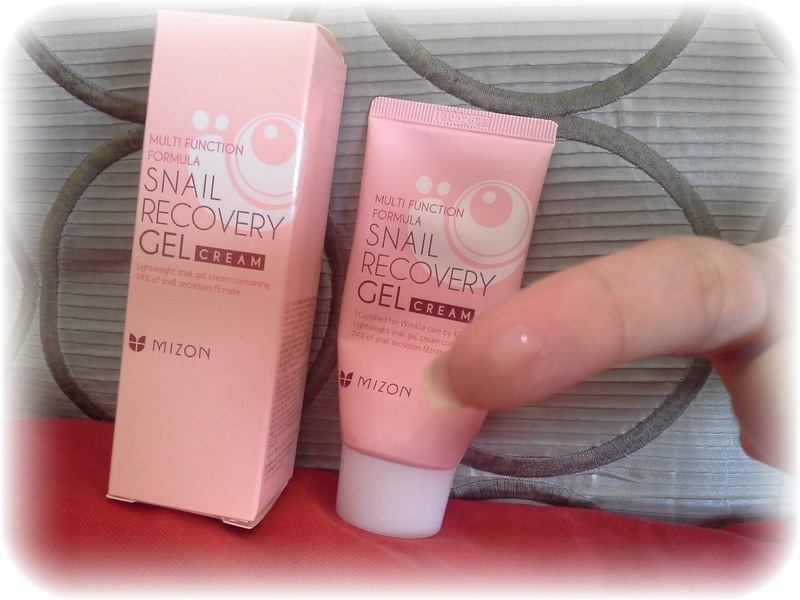 The tube only carries 45ml of product, 74% of which is snail slime. It is not sticky, by the way. Conclusion: I have another tube that I bought on offer, which means that i liked it as a night pack. I bought it out of curiosity, and it costed only 9€ on eBay. 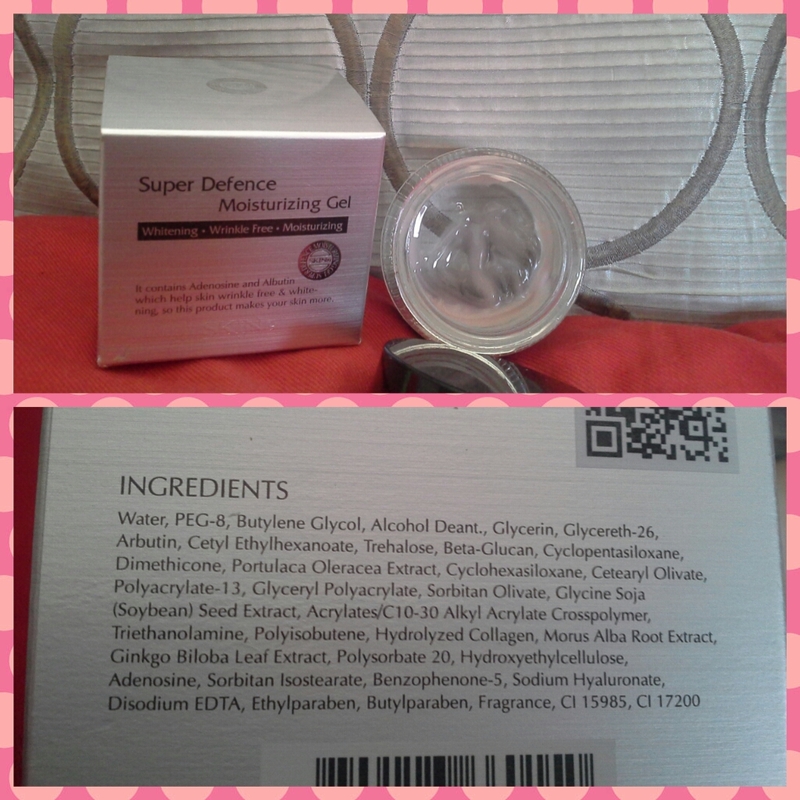 That bling bling pink tin carried 60ml of product that lasted me for three months, applied morning and night. One of the main claims of these cream is its shape memory: when you take some cream with the spatula, the dent you leave behind disapears in a few seconds. Now, that has nothing to do with the starfish extract: any cream with the same consistency will have the same shape memory. I found this cream to be very moisturizing and, even so, it also dried out the occasional pimples I get every now and then at that time of the month. The best way I found to apply this cream was to put a small amount in my fingers, rubb my fingers together to break the texture of the cream and then dab the product on my face, tapping it for better absortion. I loved the spatula that came with the cream, it kind of looks like a starfish arm/leg. 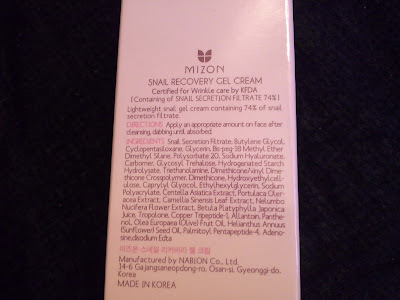 This moisturizer does not feel sticky at all and it kind of smells salty, like the sea, which is not surprising taking into account that this cream contains 70% of hydrolized starfish extract. Conclusion: I was reluctant to buy this cream in the beginning, because of the starfish. They must cut bits of the animal to make a cream like this. 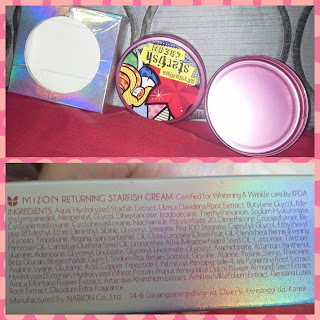 Yes, I know starfish can grow their arms and legs back but yet, this cream is not cruelty free and for that reason, though I loved how it felt on my skin, I will not repurchase this product again. And that was all for this empties post. I hope you liked it and if you feel you're missing any info, leave me a comment below and I'll try my best to give you an answer as soon as possible.